That was an extremely tiresome day at the office. The rumbling noises of my tummy made me think what I can do in a snap. Did you know that these noises have a name by the way? Borborygmus it is! Thank me later!! Then this yummy dish came to my rescue. Tada..and the hero for that day was none other than "Tomato Rice"
Heat oil in a pan. Add Groundnut. Saute it for about a min. Add Chana dal and urad dal. Saute again for about a min. Add mustard seeds, slit green chillies and ginger and curry leaves. Add finely chopped tomato and salt. Cover it and let it cook for about 2-3 mins. When the tomato is cooked properly, add rice. Cover it and let it cook on slow flame for about a min. Tomato rice is ready!!! Garnish it with coriander leaves. 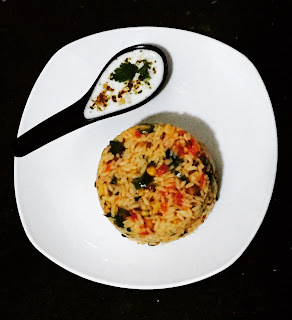 I love tomato rice with Curd.